FILCRAH held its 2nd annual spring dinner-dance at Michelangelo Banquet Center and, once again, it was a successful event. Estela amd Yoyex, FILCRAH Social Directors, did a fantastic job organizing the event and with Estela emceeing, everything went smoothly. Excellent music by D J Ray Sibayan, lots of dancing, good service and food by Michelangelo – it seems most everyone had an enjoyable time. The officers and Board of Directors thank all those who brought desserts for the late night table and those who donated door prises. Many thanks to Aida and Nick Suarez for the specially made FILCRAH banner from the Philippines. It is a priceless gift which FILCRAH can use for many occasions. Thanks also to all the members and non-members for their support with their attendance. This support was even more important because for every ticket sold $5.00 was to be donated to the Development and Peace Tsunami relief. This is in keeping with our mission of being involved in helping disaster victims and support other worthwhile causes. There was a general membership meeting last February 20th at the HFCC with a fairly good attendance. It is hoped that even more members will attend next year’s general membership meeting. 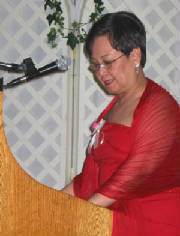 The most discussed topic was regarding the decision to donate five dollars from each ticket sold for the April 1st dinner-dance to the Tsunami relief. Many passionately expressed their opinions that the money should be sent to the Philippines instead. In the end, the Board’s decision to help the Tsunami victims was unchanged. However, the members were assured that some future fundraising efforts be directed to help our “ Kababayan” back home. So as a start, there will be a fundraising dinner-dance at Michelangelo Banquet Center on September 30th 2005. It is co-sponsored by FILCRAH, Ato-Ato Club and Gaspar & Cris Aberilla- Nourish the Children Reps. The objective is Feed the Hungry, Philippines. The money generated from this event will support the invaluable work of the Sisters, Missionaries Of The Poor. The Sisters provide shelter, food, clothing and teaching for the homeless. Many of them children and babies who are abandoned by parents who are destitute. They care for the sick at dump sites in Balatas, Naga City and Catmon, Malabon, Manila. To the Sisters, the “Basureros” are also God’s people. These selfless, dedicated Sisters truly need our help. Everyone is urged to buy a ticket to this very important fund-raising on September 30th. We hope it will be a sell-out. Another fund-raising effort by PHILCRAH is a mini-bazaar at the HFCC on August 14th 2005, 8:00 AM till 5:00 PM. Any one who wants to help or donate anything, even baked goods, can contact any of the Officers and Board of Directors. Such donations will be greatly appreciated. One of the many activities organized by Estela and Yoyex was a trip to Atlamtic City last April 16-18th by a busload of retirees and friends; they stayed at Bally’s Claridge Hotel and Casino. By all accounts, everyone had a good time. They enjoyed shopping at the nearby outlet stores where many found bargains, and of course playing the slots and tables. Apparently, there were many requests for this trip to be repeated next year. 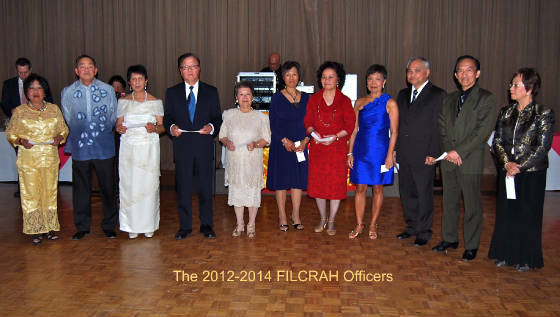 It has been 2 years since the idea of FILCRAH was conceived, and it has become a vibrant, active organization with new members joining as they retire. With members’ enthusiastic support and participation in whatever planned agenda or activities, and with the Board’s leadership, FILCRAH can indeed achieve its objectives and be a worthwhile association that we all can be proud of. Listed below are some of the remaining schedules of ongoing events since January of this year. Most of these outings are sold out early, so if you fancy any event, reserve early by contacting any of the designated officers listed above. Non-members are welcome depending on space availability.